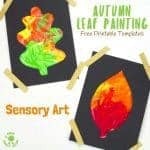 This Handprint Acorn Lacing Craft is a fantastic activity for Autumn. 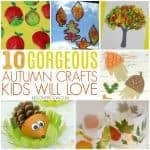 If you’re anything like us then you and the kids probably love collecting real acorns, pinecones and conkers at this time of year. 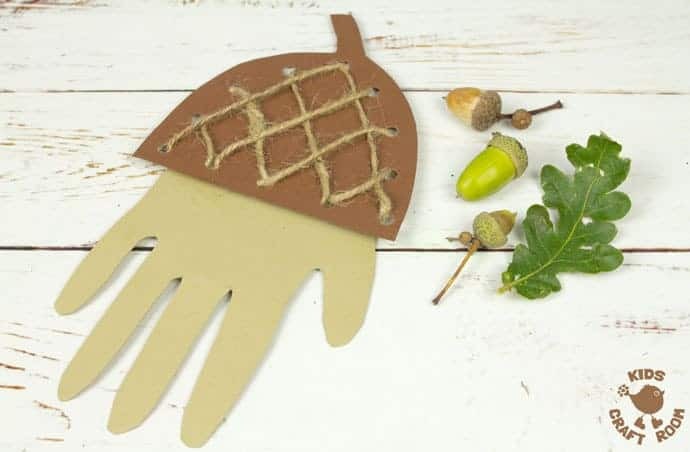 This handprint acorn craft is great for a cosy afternoon in after you’ve been out on a Nature hunt! 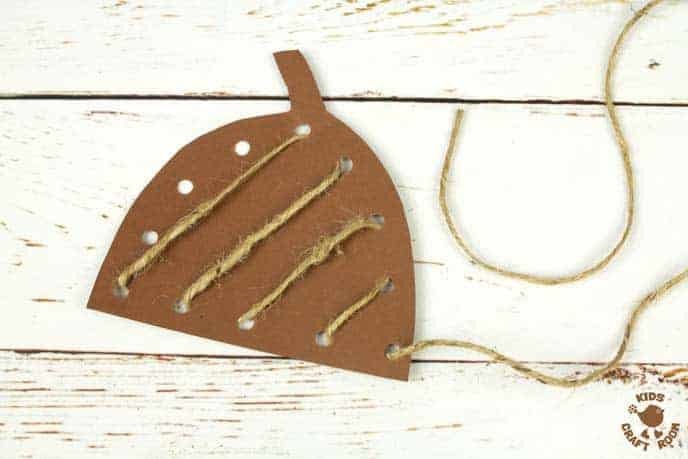 We think this acorn craft for kids is a little bit special because it’s a lacing craft too! 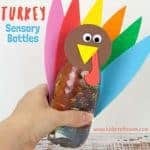 Kids can make an acorn that has a lovely textured cap just like real ones and they’ll be building their fine motor skills too! 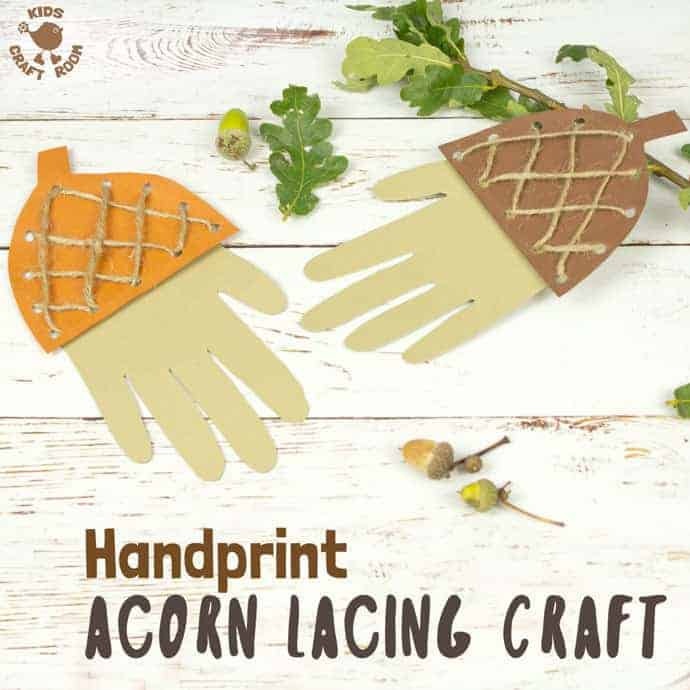 We love acorn crafts be they with real acorns like these adorable acorn mice and acorn tea set or acorn paper crafts like this one. 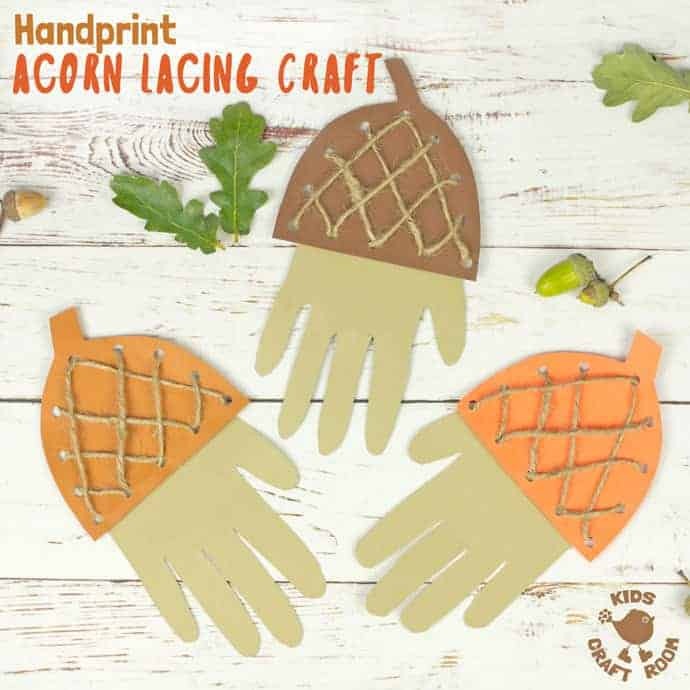 We’ve made our handprint acorns using traditional woodland colours but I think they’d look gorgeous in all sorts of colourful bright colours too. 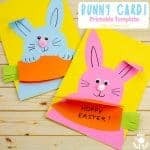 Do let us know if you give it a try. 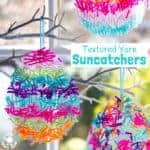 We chose to use jute yarn for our acorn lacing activity because we loved the natural rustic feel it gave but you could use ordinary yarn too if you prefer. 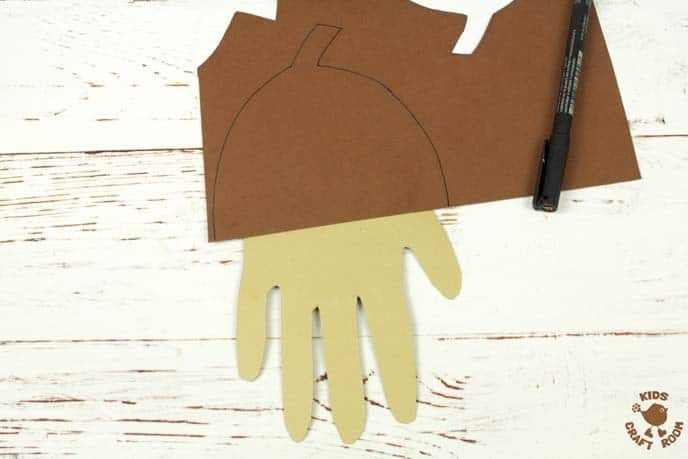 1 – Start making your acorns my tracing around your hand onto light brown cardstock and cutting it out. 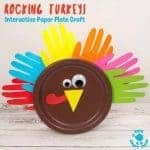 2 – To make the acorn cap place the edge of your dark brown cardstock across your hand and drawing a slightly elongated semi circle and stalk the appropriate size for your hand. 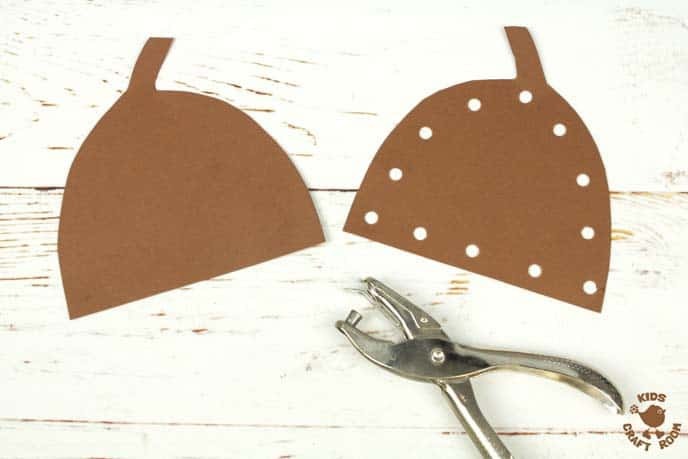 3 – Cut out the acorn cap and make holes around the edge for lacing. If you want a regular crisscross pattern like the ones we made pay careful attention to where we put the holes. We have five holes along the bottom and 5 at each side with both sides sharing the fifth hole in the middle below the stalk. 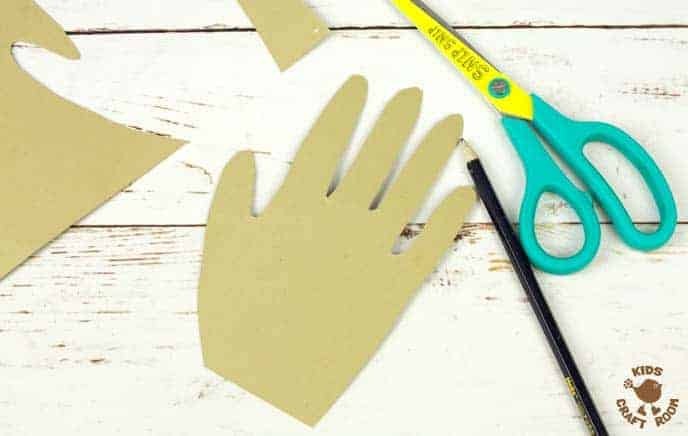 4 – Cut some jute twine, about two arms lengths should do. 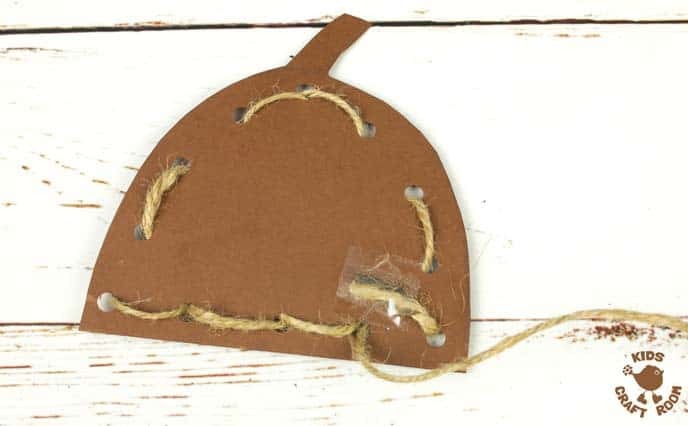 Tape one end onto a bottom corner of the back of your acorn cap. 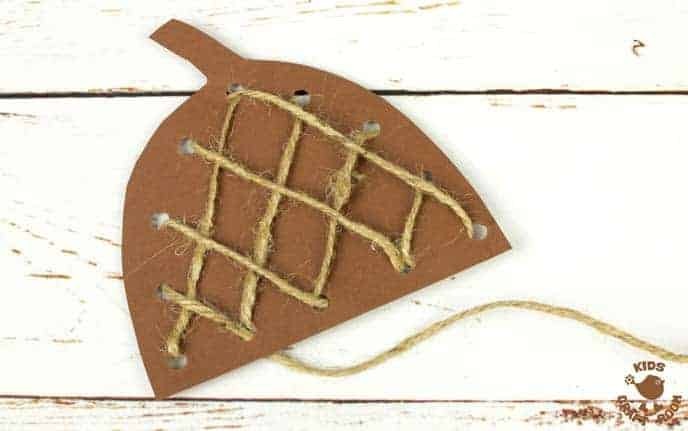 5 – To make your acorn lacing craft easier for little hands you can wrap a short piece of sticky tape around the other end of the jute twine. 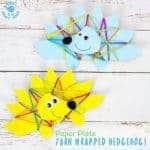 It makes the end more rigid and stops it fraying as you thread it through the holes. 6 – Start threading from the bottom corner up to the top middle. Jump down a hole on the opposite side to your starting corner and come back to the next hole on the bottom. 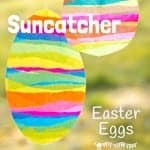 7 – Jump along the bottom to the next hole and then back up to the top next hole. 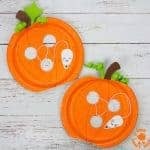 Keep on lacing until you reach the far bottom corner. 8 – Repeat the same lacing pattern going in the opposite direction. 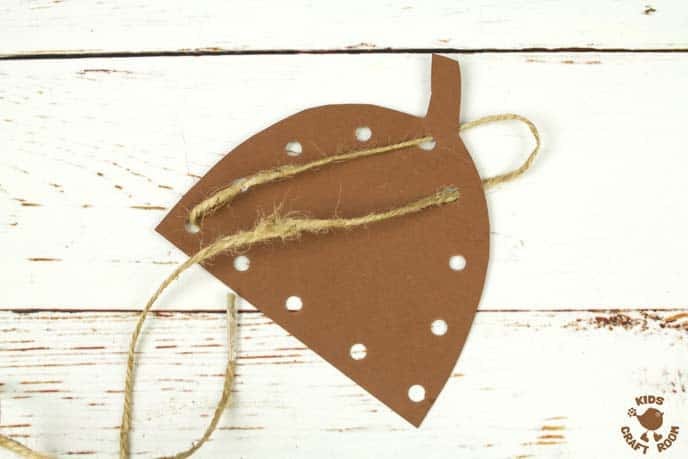 9 – The back of the acorn craft will look a bit messy but that doesn’t matter because it won’t show. 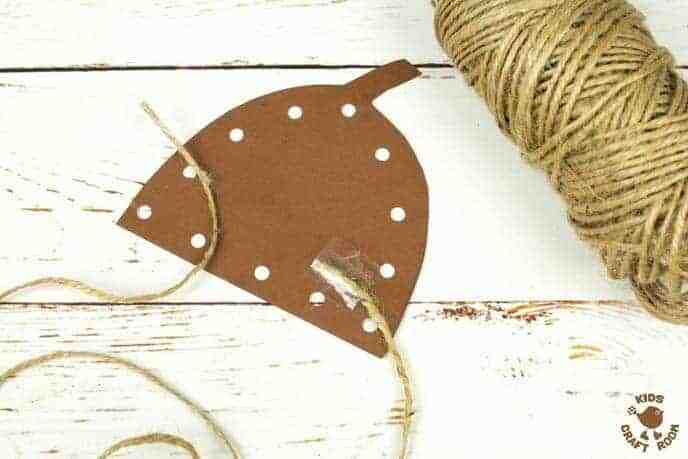 Snip off your excess jute yarn and tape it to the back. 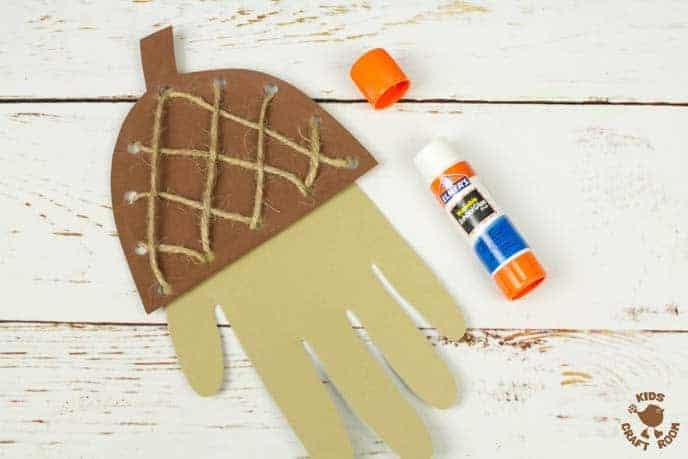 10 – Glue your woven acorn cap onto your handprint. 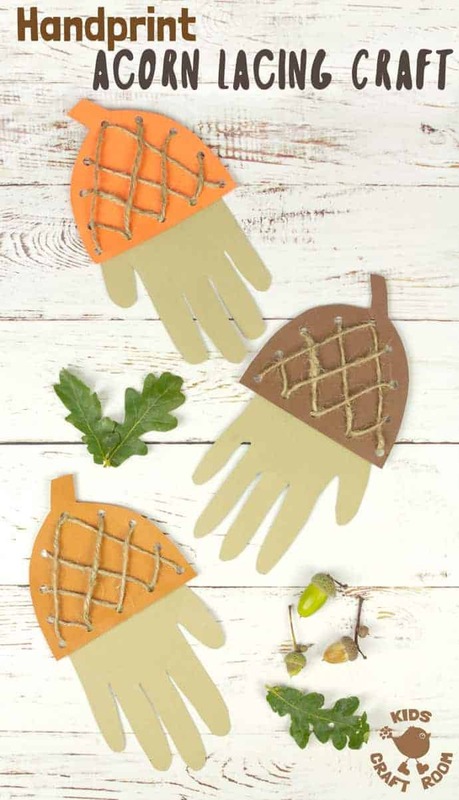 We think this handprint acorn lacing craft is a super fun Autumn activity for kids. 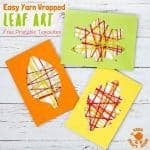 The jute yarn adds a lovely rustic and natural feel to the acorn craft don’t you think?